People who have had surgery or suffer from debilitating conditions due to illness or aging can have a very difficult time being mobile at home. If the home has multiple floors with stairs it can be even more challenging. Not being able to move from floor to floor to use bathrooms, kitchens and laundry room can greatly inhibit a person’s daily activities and even lead to feelings of inadequacy and depression. At Indy Stair Lifts we understand the need for people to continue living life on their terms which is why we offer a full line of high quality stair lifts for homes so you can stay active. Many senior men and women have difficulty walking and some are unable to move up and down stairs because of physical conditions associated with surgery, aging and illness. Though they don’t need to be hospitalized or in an assisted care facility many older people find life at home difficult if they can’t get around all the rooms. With durable and functional residential stair lifts people can enjoy the freedom of being able to move about their homes without having to bother family and friends. With a professionally installed home stair lift you can return to your daily activities that involve moving from floor to floor. Whether your home has a traditional stair case, narrow stairs or a curved design we have affordable and reliable home stair lifts that will custom fit your stairs and provide a comfortable mobility aid that will make life at home much easier. 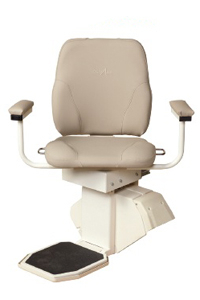 Our high quality stair lifts feature seven upholstery choices, manual or power folding rails, power swivel seats with for upper landing exit and entry. Designed with comfort and function in mind the Indy home stair lift collection has several models to choose from to suit your needs. With a direct drive motor our residential stair lifts operate with very little maintenance required and the lifts can be easily powered by plugging into a wall outlet or using two 12-volt batteries that allow the lift to continue working even during power outages.